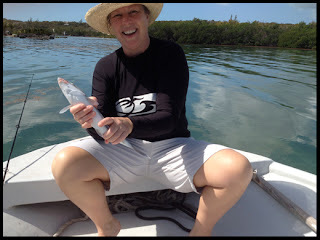 I came across this blog posting by Maria Rodale on the Huffington Post detailing a beginners trip bonefishing. By day, Ms. Rodale is Chairman and CEO of the largest independent publisher in America. This posting is a great read because it's a very different perspective on chasing the gray ghost. She had a younger daughter along so it was neat to get a parents perspective on flats fishing. Her desire to go flats fishing was born from, you guessed it, a Garden and Gun article on bonefishing. Very cool. I've got to give her props for trying something new that she heard was "very hard." So when she said she caught a bonefish without bait while practice casting, I assume she means the bone struck her bare hook?